Leading up to NAIAS, Hyundai’s biggest reveal was all set to be the plug-in Sonata debut–a redesigned hybrid that took 27 months and approximately $164 million to complete. Despite jumping the gun and revealing the retooled 2016 Sonata hybrid in Seoul, the automaker appeared determined that the Sonata was its best offering. At that point, it hadn’t actually been confirmed if the powertrain shown in Seoul would be the same as the American Sonata arriving at Detroit. Then, rumors began that Hyundai had another trump card to play. Speculation abounded. 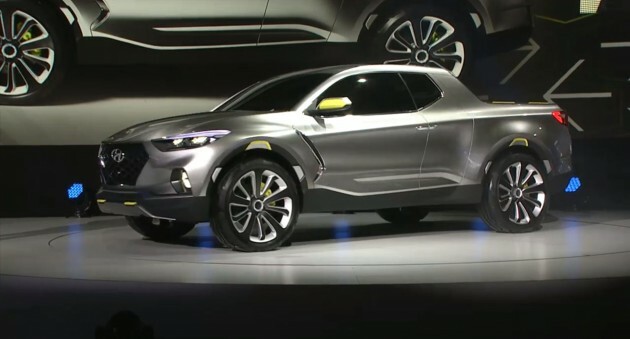 Perhaps Detroit would see the reveal of a Hyundai pickup truck. But based on the Tweet from Hyundai seen below, other people were expecting something lower to the ground, like a Veloster hatchback. 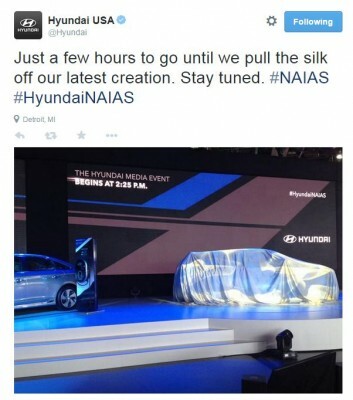 Finally, Hyundai’s plug-in Sonata debut took place on the first afternoon of NAIAS. 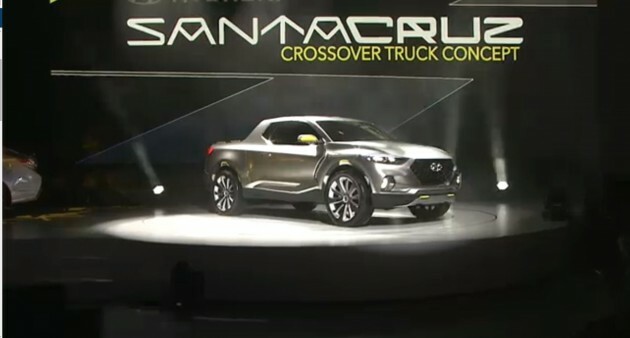 The amiable presentation wasn’t very enthralling–until the automaker’s secret was revealed: a jaw-dropping Santa Cruz crossover truck. After a review of the brand’s 2014 sales year, admitting that it didn’t keep up with the industry-wide growth rate, Hyundai America CEO Dave Zuchowski hinted at an interest in the emerging truck segment–specifically CUVs. Then, Zuchowski shared the stage with other Hyundai executives to discuss Hyundai’s achievements and future plans to continue producing “inspiring technologies,” including a fleet of alternative next-gen powertrains (hybrids, plug-in hybrids, and fuel cell vehicles). 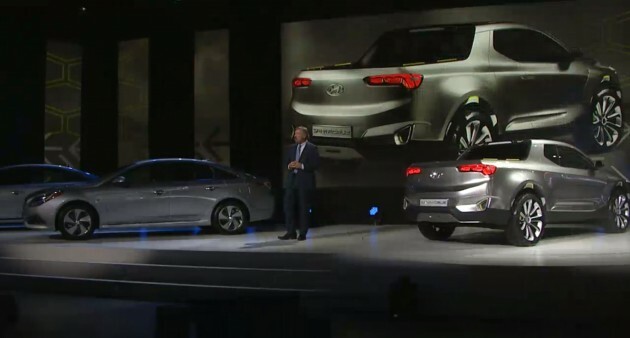 The 2016 Sonata Hybrid and 2016 Sonata Hybrid Plug-In on display during the presentation were evidence of objective. But the debut of the plug-in Sonata wasn’t what grabbed people’s attention at Hyundai’s NAIAS press conference; it was the unexpected Santa Cruz crossover/pickup, code-named HCD-15. Needless to say, the CUV divided spectators by its “unique and bold” design. Its extendable bed and titanium-colored body were… hard to look away from. Hyundai spokespeople made a reasonable case as to why such a vehicle is needed, from customer feedback to industry trends and gaps. It’s the amalgamation of all consumer suggestions the brand has received. While the unique Santa Cruz pickup might meet all those needs, will anybody want to actually drive it? As can be expected, Hyundai representatives were highly concerned with customer satisfaction to deliver the best presentation possible. The press conference presentation was followed by a post-show Q&A with Zuchowski, in which questions submitted by virtual and in-person spectators were addressed. Needless to say, many people had questions on the direction Hyundai is taking with its overweight Silver Surfer–err, the Santa Cruz.